Synaptop™ launches Dailies and Cloud-D™! LOS ANGELES, August 6, 2012 — Synaptop (www.synaptop.com) officially announces the launch of its Dailies Solution and Cloud-D™ at the 2012 SIGGRAPH conference in LA. Synaptop’s Video Dailies Software lets studios save time and money while increasing efficiency by viewing dailies on the cloud in real time with production or film staff located remotely. Synaptop provides synchronous viewing of videos in high definition remotely on any platform. This Dailies Solution lets producers, directors and any members of the production or film crew watch, collaborate and annotate remotely in real time. While viewing footage on the cloud synchronously, users can video chat or text chat on Synaptop at the same time, giving feedback while watching simultaneously. Timecode and keycode numbers can be included in the editing process, allowing for easy editing and annotation. Viewers can pause, fast forward, and rewind; all fellow viewers see all changes in sync. Synaptop also lets users annotate videos and scripts. 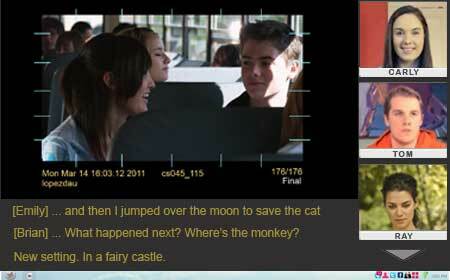 Scripts in various formats can be displayed alongside footage with timecode tags that let users navigate footage easily via links that refer from script to footage. Synaptop is bringing dailies to the cloud. Synaptop is also launching Cloud-D™ at this year’s SIGGRAPH in LA. Cloud-D™ allows users to interact with 3D content synchronously. Users can showcase their 3D models remotely in real time while engaged in text and video chat. Cloud-D™ lets users rotate, pan, zoom, and apply other operations to 3D models all synchronously with their followers. Users can also add annotations to models, switch between views, and more. Synaptop™ is a virtual computer on the cloud that lets users store and share files, run apps, and collaborate on every app in real time. Synaptop produces cutting-edge cloud technologies to offer business solutions such as Digital Asset Management, Customer Service Solutions (co-browsing), SynapView (synchronized video watching), and more. Synaptop™ can be accessed from any internet browser on any device. Best of all, there is nothing to download, and signing up for an account is absolutely free!